Bedroom suite in Country estate. $pending The Night Near Cold Spring Airbnb Has A Great Place To $tay ! In Westchester County, husband-and-wife actors Richard Gere and Carey Lowell created an intimate B&B and restaurant. Three storied residences, all within an hour-and-a-half drive of Manhattan, recall the spirit of country estates of yore. The tradition of owning grand weekend estates an hour or so away from bustling metropolises is hardly anything new. (For further proof, see Edith Wharton or Henry James.) And for quite some time, those chic spots were well-guarded secrets—places that were kept quiet by those who lived there and strictly off-limits to those who didn't. But in the last year, in several such communities outside Manhattan, local entrepreneurs have added "innkeeper" to their résumé. In the spirit of the Wheatleighs and the Lenoxes, they've transformed three distinct turn-of-the-century homes into elegantly preserved retreats, each outfitted with modern trappings and housing a restaurant helmed by a top chef. These aren't just charming hotels for frazzled New Yorkers; they're clubhouses for locals, places to gather and socialize over dinner or drinks. (Some regulars, as in the case of the Glenmere Mansion, in Chester, New York, even choose to drop in via private chopper for dinner.) Whatever one's method of arrival, the valet comes standard. Tucked into the scenic Lower Hudson Valley, this 150-acre country retreat eloquently combines past and present in a very grand fashion. With its salmon-colored stucco façade and azure shutters, the Glenmere Mansion is something of an Italianate folly, located smack-dab in the dairy farmland of Hudson Valley. That's exactly what caught the attention of the estate's owners, Dan DeSimone and Alan Stenberg, who live in nearby Tuxedo Park, New York. DeSimone first spotted it during a leisurely Sunday drive through the area in 2006. "When Dan returned home we called our broker immediately," says Stenberg, a former public relations executive who, like his partner, DeSimone, a surgeon, is a first-time hotelier. "When we learned of its history, we had to have it." The duo spent the next three years on a top-to-bottom $30 million redo, transforming the estate into a 19-bedroom retreat that quietly opened earlier this year. The 1911 villa, built as a country house for real estate mogul Robert Goelet IV, was designed by architecture firm Carrère and Hastings (who did the New York Public Library and the Frick Collection). Stenberg and DeSimone worked closely with New York–based interior designer Scott Snyder to maintain the historic integrity of the villa, which over the last 25 years had fallen into disrepair. They even consulted the original landscape plans for the European-style gardens; eventually lilacs, peonies, and forsythia were decided upon. Despite its lavish public spaces—an elegant drawing room has a self-playing grand piano, the library is dark-paneled mahogany swathed in silk and velvet—nothing at Glenmere feels precious. The amicable staff encourages guests to explore each nook and cranny, settle into a chaise with a good book, or lounge in one of the six canvas-draped cabanas surrounding the heated pool. Each of the 19 rooms evokes the mansion's heyday without feeling too stuffy. The window-lined Princess Suite, with its view of the cortile below, features a bold Charles Hewitt monotype from the Klein Museum outside Stuttgart, Germany, and a leather luggage rack handmade in Spain. Subtle touches—an ever-so-dim night-light emanating from under the bed, heated Carrera marble tiles in the bathroom—are homages to DeSimone and Stenberg's favorite details from hotels they've visited during their own travels. Michael Foss, once the private chef for Steven Spielberg, runs the kitchen. In the Supper Room he does formal dishes such as pan-seared foie gras and pork tenderloin with an apple cider sauce and braised cabbage, while at the Frog's End Tavern the less fussy menu leans toward elevated comfort food: an apple relish–topped turkey burger on brioche, or a pizza with figs and Maytag blue cheese. DeSimone and Stenberg have put as much emphasis on the service as they have on the design and food—and it shows. Guests can take meals anywhere on the grounds, from the bougainvillea-filled cortile to the wraparound terrace. And the staff has been known to arrange for guests' dogs to be boarded nearby. "Most of all we wanted Glenmere to feel like you've come to visit your rich uncle's estate," says Stenberg, "where you're free to wander and do as you please." Rooms, from $550. At 634 Pine Hill Rd. ; glenmeremansion.com. In keeping with the property's country-club feel, Glenmere has introduced a Small Bites on Starry Nights menu, which pairs martinis with shareable plates like deviled eggs topped with caviar and prosciutto–wrapped feta. Glenmere will open an intimate five-treatment-room spa, complete with a bathhouse and an herbal steam room, in early 2011. Residents of Bedford, New York, may think of their town as sleepy, but with Ralph Lauren, Donald Trump, and Martha Stewart calling this hamlet home, it's anything but. Since its opening last summer, the Bedford Post has become a de facto clubhouse of sorts for in-the-know locals. Two such are Richard Gere and Carey Lowell, the actors turned innkeepers who transformed this once dilapidated 18th-century house and barn, set on 14 acres, into a hotel with two restaurants and a yoga loft. The couple, who have had a home in the area for the last 25 years, wanted to create a place where "the community can come together," says Gere. But it's welcoming to outsiders, too. The eight bedrooms, which opened last August, are done in a quiet palette of gray, off-white, and light blue, and appointed with vintage Audubon prints and decorative objets d'art from local antiques shops. Six of the rooms have working gas fireplaces and stunning Portuguese claw-foot soaking tubs. Given Gere's devotion to Buddhism, it's little surprise that there's a large light-filled loft offering daily complimentary yoga classes to guests of all skill levels. Evenings at the inn's formal Farmhouse restaurant, which opened to much acclaim in November 2008, reveal a crowd of navy-blazered and pearl-clad Bedford residents. (Martha Stewart has been known to ride up on horseback.) Sourcing ingredients from neighboring farms, chef Brian Lewis prepares memorably delicate pasta dishes (soft farm-egg ravioli and lobster spaghetti chitarra among them), in addition to a seven-course tasting menu. A health-conscious breakfast of homemade granola and poached eggs, served in the more relaxed Barn, is accompanied by homemade mixed-berry crostada and scones, which are happily packed for the journey home. Rooms, from $395. At 954 Old Post Rd. ; 914-234-7800; bedfordpostinn.com. A working farm meets top-notch cooking and schooling at Ninety Acres in New Jersey. After opening properties in the Caribbean and South Africa, Peapack-Gladstone, in New Jersey, seems an unlikely location for Sir Richard Branson's first Virgin Limited Edition property in the States. But for the next three years Branson and his business partner, Bob Wojtowicz, will turn 90 acres of a 500-acre estate once owned by the king of Morocco into a hotel called Natirar. Only its Ninety Acres restaurant and culinary center are open so far; the hotel and ten cottage suites, a spa and a pool will follow in 2011. Ninety Acres' farm-to-table–style menu culls nearly 80 percent of its ingredients from nearby purveyors. (Though with a 15-acre garden out back, maybe "farm-at-table" is more apt.) Standouts include poached eggs with potato hash and pork-belly pizza. More adventurous diners should consider the four-course Bring Me Food tasting: no menu, only a list of ingredients from which chef David Felton will whip up whatever strikes his fancy. Popular with the local set—and, increasingly, those from farther away—is Natirar's culinary center. In a copper-and-granite exhibition kitchen adjacent to the restaurant, visiting chefs teach three-hour cooking classes on topics like "Puff Pastry Sweet and Savory" and "Gastronomic Grill"—recipes included. At 2 Main St.; ninetyacres.com. Thyme in the Country bed and breakfast will be hosting visitors for the 2010 hunting season, offering personal service designed for those interested in sustainable hunting, and a memorable stay at one of upstate New York’s most eco-friendly inns. PRLog (Press Release) – Dec 03, 2010 – Hudson, New York, USA –The Thyme in the Country bed and breakfast is pleased to announce special accommodations for the hunting season, offering a chance for hunters, or those wanting to learn to hunt, an ecologically minded way to experience a hassle-free hunting excursion. A certified tracker and hunting guide will be available for a step by step field education. Thyme in the Country has the flexibility to provide the best possible experience, with an emphasis on sustainable hunting practices. Ample space for hunting equipment is available, and early breakfasts, delicious packed lunches, and a hearty evening meal can all be arranged, with most ingredients sourced from Thyme in the Country’s own organic garden. A “Green” inn, Thyme in the Country’s many amenities include guest rooms fitted with natural fiber bedding and rugs, graceful antiques, organic vegetable, herb and flowers gardens, a salt-filtered swimming pool, and expansive acreage, suitable for all seasonal outdoor activities. The Thyme in the Country bed and breakfast is an ecologically friendly, self-sustaining farmhouse built in the 1880s, and located in the picturesque Columbia County area of upstate New York. The inn features gracious, well appointed guest rooms, hearty, delicious breakfasts using local and homegrown ingredients, and offers more than five acres of farmland, filled with an organic garden, peaceful meadows, and the inn’s own pond. Excellent restaurants, wineries, and antiquing are located nearby in charming Hudson, New York, and the landscape of the surrounding Hudson River Valley offers inn goers a chance to explore some of America’s oldest historic sites. The inn is a new member of the www.iLoveInns.com website, America's most beloved inn directory. For more information or to book visit: http://www.iloveinns.com/thyme-in-the-country-id40159.html or contact the innkeepers directly at (518) 672-6166. You may also search for the inn athttp://www.iloveinns.com/. With impressive historic bed and breakfasts and beautiful inns all over the US, iloveinns.com is your one-stop destination for the best accommodations. Escape to a peaceful country inn or an intimate bed and breakfast. The choice is yours. Located just 75 miles north of New York City, Minnewaska Lodge is a contemporary 26-room mountain lodge on 17 secluded acres, nestled at the base of the spectacular Shawangunk Mountains. Enjoy hiking, mountain biking, swimming, golf, cross-country skiing, or the world-renowned rock climbing in Minnewaska State Park and the Mohonk Preserve, right in our back yard. Your stay at Minnewaska Lodge gives you easy access to the Hudson Valley's famous attractions. Visit the Hudson River mansions and museums, the 17th Century stone houses in New Paltz, golf courses, antique shops, excellent restaurants and shopping. Stay at Minnewaska Lodge when you visit the campus of the State University of New Paltz, the Woodstock/New Paltz Crafts Fair, the apple and pumpkin picking festivals, wineries, theater and art shows, kayaking, rail trails, skydiving, horseback riding, fishing and much more. - enjoy the retro sounds of the 60s, 70s and 80s here at The Rhinecliff !! No Cover. Saturday Night Late Lounge and Dance Party - 9pm ‘til late - every Saturday Chill out to the late night lounge sounds and if you’re in the mood, get on down and boogie to some retro sounds of the 60s, 70s and 80s. The Bar at The Rhinecliff features the bounty of the Hudson Valley, cooked and served with classic European elegance and gusto. Sundays are a day to relax down at the hotel. The Brunch at The Rhinecliff offers all your favorite brunch classics, served with Hudson Valley soul. Classic brunch favorites – Eggs Benedict, French Toast, Shirred Eggs. After a long winter of dealing with frigid temperatures, freak snowstorms and the gloom of a faltering economy, spring has finally arrived - at least officially. Friday's snow shower proved springtime in March is something of a formality. But New Yorkers watching their dollars don't have to go far to shake the post-winter blahs. Here are five quick upstate getaways, all within a couple of hours of the city and about $500 or less, where you can spend the weekend relaxing, rejuvenating and reenergizing the soul without breaking the bank. This cozy, 18-room inn has gorgeous grounds overlooking Tinker Creek, where you can watch deer and other wildlife in a rustic setting yet still be within walking distance of the town of Woodstock, home to one of America's oldest artists' colonies. Tinker St., Woodstock's main drag, is full of small bookstores, funky boutiques and art galleries. Spend a lazy afternoon strolling and exploring, then dine at any of the highly regarded restaurants in town. The Inn has rooms of various sizes, making it a perfect escape for a romantic weekend or a family getaway. Rates start at $129 for a standard room, which includes a breakfast buffet featuring locally baked goodies. 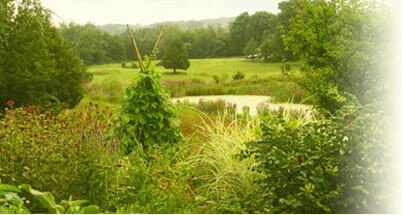 48 Tannery Brook Road; 1-800-420-4707; (845) 679-8211; www.woodstock-inn-ny.com. You don't have to travel to India to find your spiritual side. Ananda Ashram, about an hour from Manhattan in Monroe, was established by the Yoga Center of New York in the 1960s and is a popular destination for yoga practitioners from the city. The weekend program begins on Fridays at 6 p.m. with two daily yoga classes for all levels. The tasty vegetarian meals are served, buffet-style, in the dining hall at set times. Just 50 miles from the city sits Warwick, a quaint town surrounded by hiking trails and orchards that serves as a relaxing escape for any harried New Yorker. Check yourself into a room at the homey Warwick Valley Bed & Breakfast, a colonial house in the heart of the charming village. The pace is nice and slow on Main St., where you can fill an afternoon antiquing and window-shopping, then enjoy a good meal at one of several restaurants. If you're in the mood for some vino, there's no shortage of tasting rooms at the vineyards along the Shawangunk Wine Trail (www.shawangunkwinetrail.com), which runs through Warwick. Warwick B&B rates start at $120 and include a hearty breakfast. There's also a choice of weekend shopping, dining and skiing packages, starting at $300. 24 Maple Ave. (845) 987-7255; www.wvbedandbreakfast.com. Head to the heart of the Catskills for a weekend of relaxation and peace at New Age Health Spa, situated on 280 scenic acres. Explore the lush grounds on guided hikes, dine on delicious meals - including salads with herbs and vegetables grown in New Age's greenhouses - or enjoy one of its many yoga and fitness classes, and within a day you'll certainly feel refreshed and de-stressed. And if this doesn't do the trick, swim some laps in the indoor pool or simply book a spa treatment. Rates start at $259 a night for a two-night minimum stay, but New Age is all-inclusive, so everything is covered (with the exception of spa treatments). Solo travelers can be placed with a roommate to keep costs down. Through May 21, guests who pay for two nights and four spa treatments can bring a friend along for free. 7491 State Route 55, Neversink. 1-800-682-4348;www.newagehealthspa.com. The Roxbury isn't your typical roadside motel. If you're a fan of kitsch, book one of the colorful theme rooms inspired by '60s and '70s shows like "The Partridge Family," "The Mod Squad and "The Jetsons" to lighten your mood. You can't help but feel refreshed after a weekend relaxing in the heart of the Catskill Mountains. Begin your day with a breakfast of fruit and pastries in the sun-drenched dining room, then head to Roxbury's Shimmer Spa, where guests can find peace and tranquility as they lounge in a hot tub or sauna or enjoy a full menu of services in the treatment room. At night, unwind across the street at the Public Lounge, about as fun and funky a bar you'll find outside of Manhattan. Rates at the Roxbury start at $129 on weekends, which includes a continental breakfast. 2258 County Highway 41, Roxbury, NY. (607) 326-7200;www.theroxburymotel.com. Lowenstein is the author of "City Weekends: The Greatest Escapes and Weekend Getaways In and Around New York City." Lodging Destinations For Those In The "Hudson Valley State Of Mind"
The lobby of the Belvedere Mansion. The Hudson Valley has long been known as a travel destination for those looking for a break from their hectic lives. It’s not a typical tourist area dotted with motel chains—instead, people come to seek out local business and in return are presented with lodging that suits all personalities. Here, Chronogram profiles lodging choices that are far beyond a room with a view. A great number of restaurants in the region have created a concept that make local and organic de rigueur, and anything less is becoming unacceptable. Many of the resorts below have adopted the same concept. One hotel that was chosen has an accomplished restaurant that has won a slew of best-of awards. Some resorts have sprawling properties that take an entire visit to roam—one even has a maze. Most of these featured also have plush spas, even some that are eco-friendly. Buttermilk Falls, one of the more well regarded properties that manager Dan Reyburn says “is neither b&b, hotel, inn, spa. It’s really just not definable,” has a menagerie of animals that roam the property. Most have stood the test of time—some throughout hundreds of years, while the owners have painstakingly preserved the history, where generations have lived, visited, and created memories. This is about the best of the Hudson Valley’s multiple personalities. For some, the perfect getaway is not about rest, it’s just about getting away. The Mohonk Mountain House and its 2,200 acres of property with activities around every bend, are ideal for keeping cabin fever at bay. The Victorian castle is perched atop the Shawangunk Mountains, with uncompromising views of the lake. If that doesn’t float your boat (an activity that is also an option) there’s a head-spinning number of things to do, including ice skating, skiing, hiking, swimming, rock climbing, and golf. There’s even a Victorian maze on the property. It’s rumored that Stephen King has paid a visit to the Mohonk to work on his novels. Activities and daily meals, along with afternoon tea are included, but rather than schlepping it to dinner in cargos and flip-flops, gents are required to wear a jacket. And for those who want to wind down, Mohonk has an eco-friendly spa, with an outdoor mineral pool and spa treatments that will make you feel as if you did nothing the entire visit. The East-meets-West theme at the supremely chic Inn at Emerson Resort and Spa is unique from the outdoorsyness of many Hudson Valley resorts. Each Asian-inspired, jewel-toned room of the 26-room of the Inn is equipped with a gas fireplace, jetted tub, and a private deck. There’s also a 24-bottle in-room wine selection. These touches attract celebrities like the Clintons, Bill Cosby, and Victoria’s Secret and Vogue Italia models. The spa at Emerson specializes in ayurvedic rituals drawing from ancient Indian healing wisdom, along with wellness classes for those seeking rest and rejuvenation. Tamara Murray, public relations director, explained that many of the guests love the property because it’s self-contained (though exploring the area’s outdoor beauty is encouraged). You never need to leave the property to visit the spa or restaurant. Also, the Inn at Emerson is adults-only (but not in that freaky-deaky, hedonistic way), so this is the ultimate retreat. If you can’t manage a sitter then you can bring the kiddies (and the pets) along to the Lodge, the more rustic property located across the road. To say that Scribner Hollow Lodge is unique would be an understatement. With themed rooms decked out in Southwest-adobe, hunting-lodge, classic ski-duplex, and penthouse-suite styles, the lodge seems almost kitschy, but upscale comfort might be more appropriate. What makes the lodge so loveable is the modesty that it maintains. The über-accomplished on-site restaurant—worth a trip in itself—has been made famous by food and wine magazines across the country. A bathing suit should be packed for the equally fascinating grotto, an indoor, cave-like heated swimming pool that spills over with waterfalls, Jacuzzis, and a sauna. (There’s also an outdoor swimming pool.) Wintertime is king here thanks to skiing in Hunter. The lodge has partnerships and ski packages for their guests. This would be the optimum time to book that classic ski duplex. There comes a time when you’re too old for your summer-share house. Or you simply can’t endure another family reunion at a cramped cabin in the Poconos. The Inn at Stone Ridge is the lodging aspirin to your group-getaway headache. “We’ve worked to convert from a traditional b&b to a large guesthouse and are designed for big groups,” says Dan Hausprug, the owner. “Weddings are big here, but anything from reunions to girls weekends is not uncommon. Whether it’s a wedding, family reunion, or group-getaway weekend, the inn can be rented nightly, weekly, or monthly.” Built in 1757 and expanded in the late 1800s, this beautiful Dutch stone mansion lies on 150 acres of grounds. Whomever or whatever brings your group here, know that it won’t be the average vacation. How refreshing to take a dip in the almost 100-year-old swimming pool, have a bonfire, or visit the fully operating orchard/farm to pick apples, strawberries, pears, and stone fruits. If that isn’t enough to entice you, there’s always the tavern. The Beekman Arms has been called America’s oldest operating inn. Built in 1766, the list of powdered-wig-era guests is highly impressive. George Washington, Alexander Hamilton, Philip Schuyler, and Benedict Arnold all ate, drank, and slept at the Beekman Arms. From the looks of the common areas, like the Colonial Tap Room, you’d never know much had changed—and that’s a good thing. The open-hearth fireplace, overhead beams, and broad-plank floors look as if time has stood still for the last 250 years. Much of the hotel has been updated and renovated. Yet while the owners have modernized, they’ve maintained the historical colonial relevance, with fireplaces, four-poster beds, cozy quilts, and a decanter of sherry—revolutionary comforts to lull you to sleep. Buttermilk Falls Inn and Spa has managed to ditch any real “concept” and focus instead on putting an obsessive amount of energy into providing guests with the best possible experience. In fact, when you have an inn with antique-filled rooms, a modern, solar-powered spa, and a small meangerie of animals running wild on the property—it’s hard not to question the idea behind the inn. Every detail is taken into account. The eggs and veggies for your omelet come from the chickens and organic garden on the property, and the honey in your tea is from the on-site bees. The owners also make their own wax for the spa treatments (that spa boasts a new, glass-enclosed mineral-salt pool). And the animals? Llamas, angora goats, and peacocks roam the 70 acres of lush land here, where you’ll most likely see more four-legged friends than your fellow guest (there are only 16 charming rooms at Buttermilk Falls, each with their own whirlpool tub). How’s that for a concept?